The weather has today’s Phillies game looking iffy. But if you do head out to the ballpark check out the Texas Tommy (pictured above) or the Ripper. 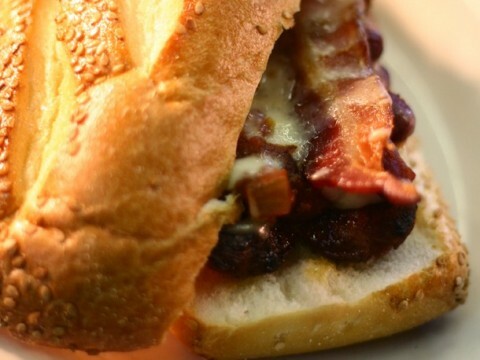 Both hot dogs made Serious Eats’ The Craziest Major League Baseball Hot Dogs of 2012 list. Both hot dogs are available at Harry the K’s and trump any dollar dog offering. The Texas Tommy is a split-grilled Hatfield dog with bacon, chili and American cheese. The Ripper boasts a deep-fried dog topped with caramelized onions and mustard, served on a toasted potato bun.